Rupert Murdoch called Tony Blair urging him not to delay the invasion of Iraq, former Number 10 communications chief Alastair Campbell has said. The claim is made in the latest part of Mr Campbell's diaries, which are being serialised in the Guardian newspaper. 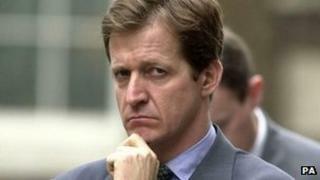 Mr Campbell said there were three calls in March 2003, a week before a crucial vote on Iraq in the House of Commons. News Corp is understood to be stressing Mr Murdoch has never denied trying to influence politicians on public policy. But the company has denied claims Mr Murdoch lobbied Mr Blair on behalf of US Republicans, describing them as "complete rubbish" and unsubstantiated. The media boss previously told the Leveson inquiry he "never asked a prime minister for anything". Mr Campbell told BBC Radio 4's Today programme any suggestion that Mr Murdoch was lobbying on the behalf of the Republican party "really does overstate it". "I don't think there was anything inappropriate about him saying what he did," he said. "Everybody knew that Rupert Murdoch was very supportive of the Iraq war." And he stressed that he was not accusing the media mogul of any "collusion". Combine three words - Blair, Murdoch, Iraq - and the result has to be a front page newspaper headline. So the Guardian's serialisation of Alastair Campbell's diaries produces a storm, but has it really told us any more about the influence of the press on public policy? Or where the line should be drawn in deciding what is undue influence? The entry for 11 March 2003 recalls that Tony Blair was irritated by the call. He saw it as part of pressure from Republicans in Washington. Campbell concludes it is "over-crude lobbying". But many would argue, in its leading articles and opinion columns, that is a newspapers' stock-in-trade. Where it would cross the line is if Murdoch had asked for commercial advantage - something he denies in the memorable phrase "I never asked a prime minister for anything". But former Liberal Democrat leader Sir Menzies Campbell said: "Why on earth would Rupert Murdoch ring Tony Blair three times in the week before the invasion of Iraq if he was not trying to influence the British prime minister?" He said Mr Murdoch's intervention was "clearly designed to steer Tony Blair in the direction of those in the United States, including Bush, who were determined to take action against Saddam Hussein and to ignore illegality". Alastair Campbell said Mr Murdoch's phone call came at a time when Mr Blair was under pressure which meant it provoked a sense of mild irritation in the then prime minister. He worked closely with Mr Blair during the latter's time as prime minister. He was Mr Blair's communications chief from 1997 to 2003. According to Alastair Campbell's book, The Burden of Power: Countdown to Iraq, Mr Murdoch's moves were made to support Republicans in Washington. The ex-Downing Street director of communications said the interventions from Mr Murdoch came "out of the blue". In one call Mr Murdoch was said to have tried to pressure the then Prime Minister Mr Blair to accelerate UK military involvement in Iraq. On 11 March 2003, Alastair Campbell wrote that Mr Blair "took a call from Murdoch who was pressing on timings, saying how News International would support us, etc". Alastair Campbell continued: "Both TB [Tony Blair] and I felt it was prompted by Washington, and another example of their over-crude diplomacy. Murdoch was pushing all the Republican buttons, how the longer we waited the harder it got." The following day he added: "TB felt the Murdoch call was odd, not very clever." The claims were dismissed by News Corporation. In a statement, it said: "It is complete rubbish to suggest that Rupert Murdoch lobbied Mr Blair over the Iraq war on behalf of the US Republicans. "Furthermore, there isn't even any evidence in Alastair Campbell's diaries to support such a ridiculous claim." Media captionCampbell on Today: Murdoch phone call to Blair "struck a bad chord"
The company is understood to be stressing Mr Murdoch has never denied stating his opinion on policies to politicians, and that he made this clear in a written statement to Lord Leveson, whose inquiry has examined the relationship between the press and those in power. After Mr Murdoch told the inquiry he never asked a prime minister for anything, former PM Sir John Major this week told Lord Leveson Mr Murdoch had pressed him on policy when he was prime minister in the mid 1990s. Sir John said the media magnate asked him to change the Conservatives' stance on Europe otherwise his papers would withdraw their support. The former prime minister recalled the exchange from a private meeting in 1997, which he said he had not spoken about before. Later that year his Conservative party lost power to Labour with the Sun backing his rival Mr Blair. Lord Justice Leveson is examining the relationship between the press and politicians amid claims it has become unhealthily close and is damaging British democracy. The judge is expected to recommend a new regulatory regime but it will be down to the government to say how, and whether, this will come into force.